Fairfax House was originally built in the second quarter of the 18th century, probably before 1735. It was acquired by Charles Gregory, Ninth Viscount Fairfax, in 1759 from whom its name derives. Together with the famous Yorkshire architect, John Carr, and his outstanding team of craftsmen, he set about the total transformation of the interior which is still visible today. One of the reasons that Lord Fairfax bought the house was to provide a home in the City centre for him and his only daughter, Anne, and that is where he lived until he died in 1772. Following his death, and without any sons, unfortunately the title became extinct and during the next 200 years the house changed ownership on many occasions. Building accounts among the Newburgh Priory MSS imply that the house was being roofed in 1755, but they are otherwise incomplete until 1761 when alterations to the rear wing were undertaken by Richard Swale, bricklayer, and William Grant, joiner and carpenter. Work on the main house was completed in 1762, when Lord Fairfax moved from High Petergate and payments include those to James Henderson for plastering, Matthew Ward and Mr Richardson for plaster roses, and Maurice Tobin for the iron railings and double gates in front of the house. Tobin also made the iron balustrades of the main and back staircases. William Grant undertook further work in the rear wing in 1762 and 1763, Daniel Shillito carved key-stones over the coach-house doors in 1764, and in March 1765 Lord Fairfax paid John Carr fifty guineas ‘on account of attending and designing his building’. Fairfax died in 1772 and subsequent occupants included Walter Vavasour of Hazelwood (1780), William Danby (1787), Peregrine Wentworth (1792), Sir John Lister Kaye (1820) and Mrs Ann Mary Pemberton (1840 – 65). The house is notable for its fine fittings, and both the plasterwork and carved woodwork combine rococo motifs and naturalistic forms. It is probable that much of the decorative plasterwork is by Joseph Cortese, the Italian master stuccatore. The S.W. front elevation is of brick with stone dressings, some of which have probably been cut back. It is five bays long, the middle bays set forward under a pediment which formerly had carvings in the tympanum around an open oculus. Area railings were removed in 1879 in connection with street widening and at the same time the present entrance porch appears to have been formed, by setting back and remodelling a portico. The ground floor windows have sills joined by a continuous band, rusticated architraves and flat heads with stepped voussoirs. A wider band marks the level of the first floor. The first floor windows, set above sunk panels, also have sills joined to form a continuous band; the architraves are plain, and above each is a pulvinated frieze and cornice. At second floor level is a moulded band. The top windows have plain surrounds, and at the wall head is a moulded cornice surmounted by a blind parapet. Both side elevations are masked by other buildings, but the upper part of that to S. E. is visible with the second floor band, and originally also the cornice, continued in brick, and blind and open second floor windows with stone sills. The entrance hall has a moulded and enriched cornice, and the ceiling is divided into three sections decorated with sprays of foliage. Corinthian pilasters flank the archway to the stair hall. The N.W. front room, formerly the Library, has a marble chimney-piece with moulded architrave and frieze with an inlaid key pattern and central key-block. The ceiling is coved above a modillioned and enriched cornice; the coves are decorated with cartouches linked by swags and festoons, and the flat part has a central octagonal panel with sprays of foliage, and surrounding subsidiary panels with alternating cartouches and portrait busts within wreaths and scrolls inscribed Alexander Pope Esq, Joseph Addison Esq, John Locke Esq and John Milton Esq. The S. E. front room or Dining Room has a dado rail, white marble chimney piece with flanking Ionic columns and elaborate overmantel of wood and plaster, and an enriched cornice with mutules. The ceiling is decorated with swags and foliage trails, with baskets of fruit at the corners of the outer border, and compositions of wine glasses and pipes, and of musical instruments, to either side of a central oval panel containing a representation of Ceres, Goddess of plenty. In the stair hall, the main stair rises in two flights and has cantilevered stone steps with later strengthening under them, an elaborate balustrade combining wrought and cast ironwork, and a mahogany handrail. The ceiling of the stair hall is enriched with plaster panels framed in guilloche and on the wall below is a medallion, with festoons and floral pendant, depicting animals and an allegorical figure holding a winged victory. Higher up are other plaster decorations with enriched brackets framed by floral sprays and drapery, and with inscribed scrolls confirming that the brackets originally held busts by John Cheere of Sir Isaac Newton and William Shakespeare, which were supplied at 2 guineas each in 1762. The staircase is lit by a Venetian window, with Corinthian columns and pilasters in brown marble. Over the window is a cartouche painted with the arms of Pemberton, the owners of the house in the mid 19th century. The ceiling is coved above an enriched console cornice; the coves are decorated with elaborate cartouches, birds and martial emblems, and the flat part is divided into decorative panels with a central allegorical figure. On the first floor, the wall between the Saloon and Drawing Room, at the front, has been removed and the large room so made extended into the adjacent house to N.W. The Saloon, the larger of the original rooms, has a dado rail and a moulded and enriched frieze and cornice, above which the ceiling is decorated with vine trails, rococo scrollwork, musical instruments and baskets of flowers. In the Drawing Room to S.E. which has a dado rail and enriched modillion and dentil cornice, coffered coving rises to a ceiling decorated with foliage around a central panel containing an allegorical figure. Rooms to the rear have moulded and enriched cornices, and one also has a dado rail. Doorways on the ground and first floors have enriched doorcases and overdoors and the windows moulded and enriched architraves. For nearly 60 years prior to the 1970’s the building then known at St. George’s Hall, was used as part of a cinema and dance hall and allowed to fall into a sad state of decay. However, when the cinema closed, City of York Council purchased the property realising the architectural importance of such a house and wanting to safeguard it for future generations. 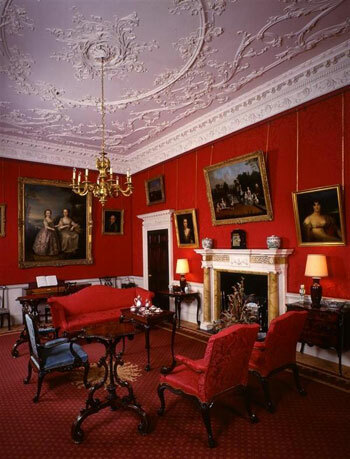 In 1981 the Noel Terry trustees approached York Civic Trust, whom they knew were looking for a scheme to secure the future of Fairfax House, and offered them the entire private collection of the late Noel Terry’s 18th century furniture, which was acknowledged to be one of the finest private collections in the Country. Noel Terry, who had been Chairman of the once famous York chocolate firm, had died the previous year and his lifelong hobby for over 55 years had been collecting antique furniture. With its future guaranteed, the Council agreed to sell the house to the Civic Trust, which enabled the restoration to go ahead. It is now recognised as one of the finest Georgian town houses in England, with a museum containing probably the grandest private collection of 18th century furniture in the Country. 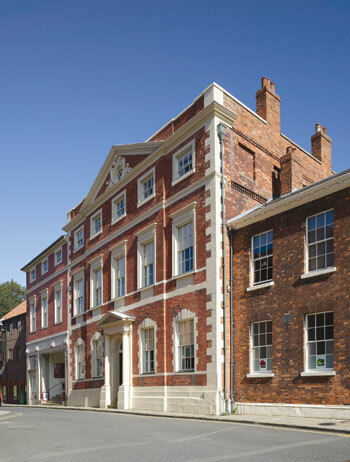 York Conservation Trust purchased the house from York Civic Trust in October 2008 and leased it back to them at a nominal rent in order that the Civic Trust could continue to run the Fairfax House Museum without the burden of the upkeep of a Grade 1 Listed building. This act guaranteed the preservation of the building for posterity, and ensured its ownership remained within York.